I’m talking about the launch of the United Nation’s Water for Life initiative – a decade dedicated to the promotion of international water efforts and raising water’s profile on the global agenda. I was curious to see what the U.N. was saying about the decade as well as what comes next. 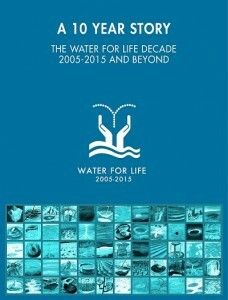 For over a decade Water for Life has driven many advances that have been followed by the water community. We measured progress in terms of advancing the overall goal of significantly increasing the number of people with access to safe drinking water. But if we take a minute to look at the progress even in broad strokes… well it’s amazing how much was achieved in just ten short years. I could go on and on about the heightened awareness regarding water safety, sanitation and hygiene issues that exists around the world. I could also talk about the establishment of partnerships that simply did not exist a decade ago. Today countries, businesses, governments, stakeholders and community leaders are all working together to help fix the global water issues. It seems that almost everyone now is paying attention, monitoring what’s happening with water worldwide, and either heading up or participating in local efforts to do their part. Progress can be expressed by the billions of people who gained access to safe drinking water and sanitation facilities. And, it can be counted by the fact that 64% of countries now have integrated water management plans in place. The final achievement also brings an answer to the question of “what next?” Now that the decade is over, certainly the Water for Life mission doesn’t just stop cold – after all, there are still around 1.8 billion people living with contaminated drinking water. The final achievement on my list is the U.N. General Assembly’s inclusion of a stand-alone global water goal in its Sustainable Development Agenda. Through this action, the U.N. has made clean water and sanitation a priority for all member states. In other words, the Water for Life mission will live on! It has been recognized globally that the mission is not over, and the foundations have been put in place for the work to be done. 100% access to safe drinking water and sanitary waste disposal conditions is, indeed, a big dream. But if the world achieved all that it did in the past ten years and continues on that course, the dream remains in reach.